WASHINGTON – In recognition of his continued impact on the players union, its members and their surrounding communities, the NFL Players Association has established its highest honor as the NFLPA Alan Page Community (APC) Award. Since 1967, the NFLPA has annually recognized one player who goes above and beyond to perform community service in his hometown and team city. Previously named after former NFL running back and Supreme Court Justice Byron “Whizzer” White, the APC Award will continue in this tradition, serving as the highest honor that the NFLPA can bestow upon a player. 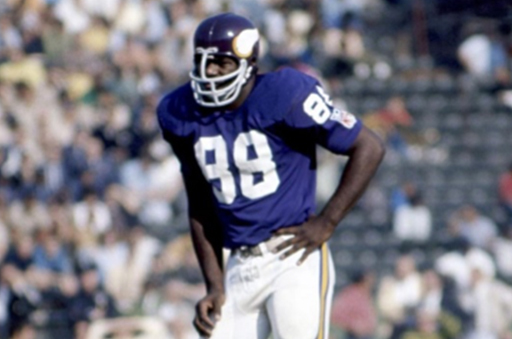 Page played 15 seasons for the Minnesota Vikings and Chicago Bears, serving as a NFLPA player rep (1970-74, 76-77) and Executive Committee member (1972-1975). The Pro Football Hall of Famer has also made his mark in the legal field, culminating with his 1992 election as an Associate Justice of the Minnesota Supreme Court. Since retiring from the bench in 2015, Page has focused his work on the Alan Page Education Foundation, which he co-founded with his wife in 1988. The organization provides financial assistance and mentoring to minority students in exchange for their further commitment to community service. The APC awardee will be selected annually from among the 18 winners of the NFLPA’s Community MVP program, which returns for its fifth season as one of the union’s hallmark initiatives. The Community MVP campaign will kick off with a Week 0 edition recognizing those players who performed acts of service during the last month of the offseason. The Week 0 winner will be announced this Friday, with the runner-ups recognized on Monday across the NFLPA’s social media channels. The NFLPA is also proud to introduce Forever Collectibles as the newest supporting partner of the Community MVP. Along with Delta Private Jets, who is entering its third season as a supporting partner, both companies have displayed a commitment to the program’s mission of recognizing NFL players who make a positive impact in their hometowns and team cities. Each week during the regular season, the NFLPA will celebrate one active NFL player who has demonstrated a commitment to giving back to his community. The NFLPA will make a $10,000 contribution to the player’s foundation or charity of choice as well as an in-kind donation by Delta Private Jets to the player for being named the NFLPA Community MVP. Additionally, a limited-edition bobblehead of each winner will be created and made available for purchase by Forever Collectibles at www.foco.comand www.sportsfanisland.com. A portion of those proceeds will be donated by the NFLPA to the player’s foundation or charity of choice. From the pool of weekly Community MVPs, a distinguished panel of judges will choose five finalists for the APC Award, each of whom will receive an additional $10,000. From those five finalists, the active player membership will vote for the APC Award winner, who will receive an additional $100,000 for his foundation or charity of choice. The APC Award winner will be announced at the NFLPA’s annual Super Bowl press conference. This campaign is part of the NFLPA’s continued efforts to support the community outreach of our members, which is not only limited to the season. For more information, please visit www.nflpa.com/community-mvp.